South Africa bowled out India for 135 in the second to win the first Test by 72 runs and take 1-0 series lead. South Africa, despite missing Dale Steyn, were driven to a 72-run win in the first Test match by Vernon Philander. The pacer took his career best figures of 6 for 42 and helped his team beat India by 135 run in the 1st Test in Cape Town. South Africa took a 1-0 lead in the three match series. 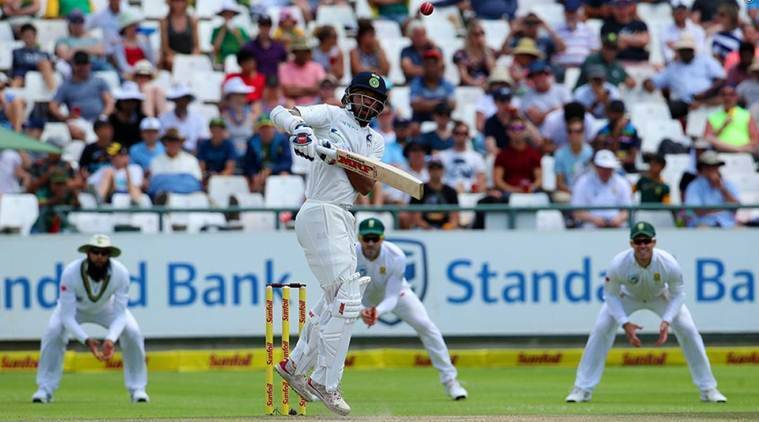 India were set a target of 208 by they were struggling at 72 for 6 when the South Africa rattled the top order. R Ashwin and Bhuvneshwar Kumar shared a 49-run stand for India before Philander returned after his first spell to clean up the tail as well. This is after India fought their way back into the Test by bowling out South Africa for just 130 in the second innings. The hosts resumed proceedings, after a washed out Day 3, at 65/2 and kept losing wickets at regular intervals. Mohammed Shami (3/28) and Jasprit Bumrah (3/39) did the early damage and Bhuvneshwar Kumar (2/33) too returned with two wickets in what was a brilliant morning session for the visitors. GONE AND IT’S ALL OVER IN CAPE TOWN! Vernon Philander continues his love affair with Newlands as he picks six wickets and South Africa win the Test by 72 runs. India bowled out for 135. 2012 hrs IST :WICKET! Philander has done it and broken the stand between Ashwin and Bhuvneshwar! South Africa brought the keeper up to the stumps. Ashwin gets an outside edge and De Kock takes a good catch. 2010 hrs IST: Virat Kohli applauding every run that Ashwin and Bhuvi get at Newlands. Can they continue the good work? 1940 hrs IST: A beautiful straight drive from Ashwin and India’s score is past 100 now. Can they come closer to the target? 1925 hrs IST: Morne Morkel and Vernon Philander bowling in tandem against Ashwin and Bhuvneshwar Kumar. 1855 hrs IST: WICKET! Wriddhiman Saha is gone. Rabada gets his third wicket. The ball came back sharply into Saha and he is adjudged LBW. Review by India but that it shows the ball kissing the leg-stump. And that is Tea! 1827 hrs IST: WICKET! Rohit Sharma doesn’t survive long after the dropped catch. He gets an inside edge back on to his middle stump and has to walk back to the pavilion. India 76 for 5 now! 1823 hrs IST: Dropped! Rohit Sharma plays an awkward hook off rising short delivery from Rabada. That shot is skied and travels to deep square-leg where Keshav Maharaj makes a compelte mess of the catch! 1722 hrs IST: Virat Kohli and Cheteshwar Pujara out in the middle for India. They are 31 for 2 and need 177 more runs to win the match and take lead in the series. 1717 hrs IST: WICKET! One gets two for South Africa. Murali Vijay, after surviving two reviews, is caught at the slips. Vernon Philander, the bowler who appealed on both the occasions, gets him. Good delivery that held its line and Vijay gets a thick edge to third slip. 1710 hrs IST: WICKET! South Africa finally get the first wicket. Shikhar Dhawan undone by the extra bounce which Morne Morkel gets. It bounces more than Dhawan expected and he gets a leading edge. Caught at gully! The ball that Bumrah bowled to get du Plessis out was one for the ages. Haven't seen an Indian bowler get bounce from a ball as full as that. 1433 hrs IST: New man with the ball, Jasprit Bumrah, gets plenty from the surface early on. Gets the ball to pitch and move into AB de Villiers with the South African batsman trying to defend. Gets an outside edge which falls short of Saha. Indian players were excited but it may have taken the forearm instead of the glove. 1300 hrs IST: Hello and welcome to our live coverage of the first Test between India and South Africa. The contest is bent in South Africa’s favour as they lead by 142 runs and have eight wickets in hand in the second innings. Aiden Markram and Dean Elgar are back in the pavillion with Hardik Pandya, India’s man of the match so far, taking both wickets. The visitors need plenty from him and Bhuvneshwar Kumar to start the opening session on a bright note – much like the weather in Cape Town today.